Memory prices are slowly going back down from their all time high. New many-core CPUs that enthusiasts are buying can make use of massive amounts of memory where cost is the more limiting factor than platform capabilities. Samsung has pushed out a product page to their website that shows new DDR4 memory at 2,666 MHz. Ordinarily, this would not be anything worth a mention, but there is an important distinction. 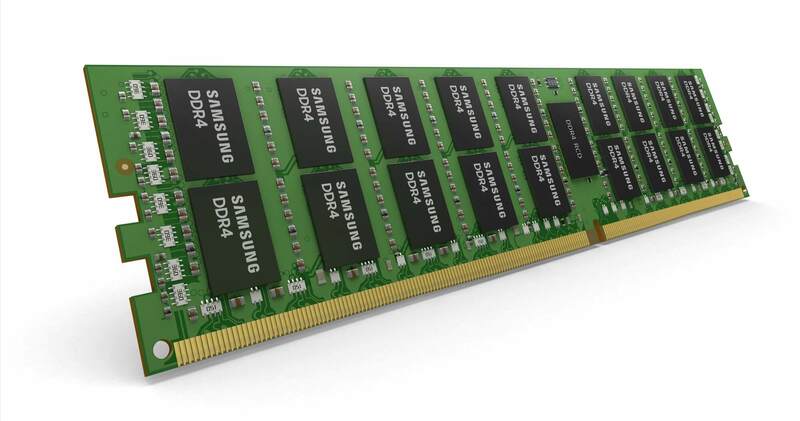 Samsung's latest memory is 32GB and arrives as a UDIMM, or in other words, regular RAM for consumer desktops. Given model number M378A4G43MB1-CTD, Samsung's memory runs at 1.2V and is a dual rank configuration. Memory chips are arranged as (2Gbit x 8) x 16. Packing 32GB per DIMM allows for up to 256GB of memory to be installed with a Threadripper CPU. In theory, Threadripper supports up to 1TB of RAM, but since there are only 8 DIMMs per motherboard, and 32GB per DIMM is about to be the densest solution available, the actual limit is much lower. Conversely, Intel's Skylake Extreme Edition processors such as the i9-7980XE only officially support up to 128GB. Small form factors such as micro-ATX that may only have two DIMM slots could also benefit from higher density memory. Running virtual machines from compact builds is about to be a lot easier. For gamers, such exorbitant amounts of memory offer no return on performance. Currently, Samsung is sampling this high-density memory to third parties. In its base configuration, its nothing more than a typical green PCB with some chips soldered on. 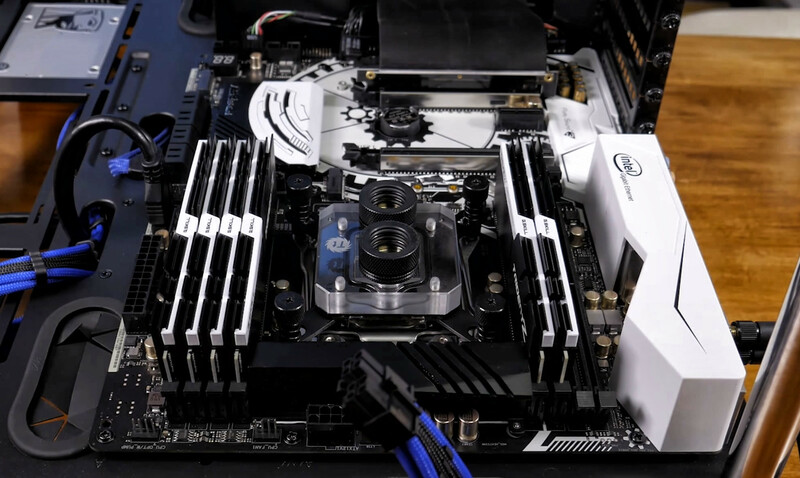 However, other manufacturers that add nice looking heat spreaders such as Corsair, G.Skill, Crucial, Kingston, and others are likely to make use of Samsung's chips. Don't worry, Chrome will always fill whatever memory you have in your system. Theinsanegamer, Dustyn, gamoniac and 6 others like this. But can it run chrome? madboyv1, Theinsanegamer, dogofwars and 3 others like this. My machine will never find out. And each stick will only run you the small cost of $399 a piece! timespacematter, skipmichael and Reehahs like this. Google seems to be over abundantly omnipresent in all usage aspects of personal computing, why would you think their browser would be any different? The chip arrangement on the render does not seem right. JaredTheDragon and skipmichael like this. It's not. There wasn't a high res render available with proper layout. 32 GB Access Memory Add-on up to 128GB or higher Flip in and out. 32 GB Perm Memory for use as Buffer or VRM instead of using slower HDD or SDD. Right here you would have 64 GB but only 32 GB was usable'. If I turn off VRM on Windows 10 and just use 32 GB DDR3 XP just see what happens sure it would run quick but memory need to have some buffering on to perm solution. There are already 32 GB DDR4 DIMMs out there, and were even available back in DDR3 time. Crucial even sells a 128 GB kit with 4 x 32 GB DDR-2666 modules. Because of this, I have no clue why this is news at all. Let me quote it for you. Ordinarily, this would not be anything worth a mention, but there is an important distinction. Samsung's latest memory is 32GB and arrives as a UDIMM, or in other words, regular RAM for consumer desktops. Your quote is talking about the same type of memory I do: conventional desktop memory modules, also known as UDIMMs or unbuffered DIMMs. So, the let me ask you again: what's newsworthy about something that's been on the market for a while? Now, there might possibly be something novel and "world's first" about these modules... but if there is, then the author of this article failed to spot what it is, because it's definitely not their capacities in this format. Trouble is, it's for servers, and it's almost $1800.00 a pop. I'm not sure how this is really news.... I mean threadripper works with ECC anyway so you could have used the 32G ECC FBDIMM's for a long time now. "Memory prices are slowly going back down from their all time high." Hate to say it, but you may not have been born yet when memory was far more expensive. See link to a chart of memory prices over the years. The recent price spike is just a little blip. LRDIMMSs are not UDIMMs and will not work with regular desktop CPUs. Threadripper does not officially support RDIMMs (I assume you mean RDIMMs not FBDIMMs), Only certain motherboard work with it and even then a firmware update may break support as it isn't validated.